Anticipating the 2020 deadline by which all manned and unmanned aircraft must have collision-avoidance capabilities, Paul Beard is confident that his company’s Ping series of such devices will garner a significant niche in the marketplace. 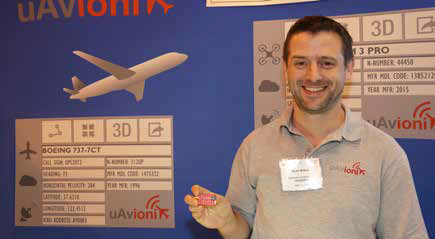 The Palo Alto, California-based company uAvionix Corp. now manufactures what it says is the world’s smallest ADS-B (automatic dependent surveillance-broadcasting) transponder, with a half-watt power output, a four-mile range and a weight of five grams. The company also offers a mid-level transponder, the Ping 2020, which has a range of 40 miles and weighs 20 grams. Making its debut at Xponential 2016 is the largest such transponder, the 75-gram Ping 200-S, with a 400-mile range. “They neutralize the traditional problems of integrating drones into the national airspace,” Beard says. “We’re looking to get increased awareness of ADS-B as a strategy for safety for drones and airplanes.” The company also hopes to form relationships and partnerships with UAS manufacturers as well, Beard says. UAvionix’s drive to create and market crash-avoidance devices began a year and a half ago, with the introduction of the smallest of the three units. “There was no commercial silicon available, because the large-scale commercial silicon companies don’t invest in the aviation business. The volumes are [too] low. We had to start from scratch and develop our own low-cost components,” Beard says.